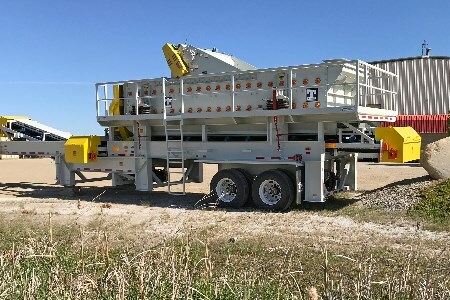 Haver & Boecker, a leading equipment manufacturer and solutions provider for aggregates and mining applications, offers the Tyler L-Class vibrating screen for classifying wet or dry material, as well as an ideal dewatering method. The compact machine is versatile and easy to maintain, with no timing belts or gears that normally need replacing. tProducers can customise the 6 ft wide machine in two lengths, a 16 and 20 ft length. Primarily mounted horizontally, the L-Class can also be inclined or declined as much as 3°. The linear L-Class handles up to 400 tph and features a 45° mounted double shaft overhead drive system with direct mounted motors. Producers can access multiple speed and stroke options by changing the pulleys and plate weights. The application specific body design offers simplified maintenance with a one piece removable head and shaft assembly. In addition, unlike most linear stroke machines, the L-Class does not require timing belts or gears, making maintenance even simpler. The L-Class is also ideal for separating water from product in dewatering applications. When positioned at a negative incline of about 3°, the vibrating screen’s g-force moves wet material uphill on the screen. Gravity and the natural operation of the equipment help screen out water before the material reaches the discharge end. The thick layer of material on the screen also acts as a filter cake and presses water out, as well as traps fine particles that would be lost in a thin layer screening process. Many operations are eligible to receive Haver & Boecker’s Uptime Service Package free with the purchase of an L-Class. The service programme provides 36 months of warranty coverage on any new equipment purchase. Uptime offers customers a full-service approach to equipment optimisation, from parts inspection and equipment assessment to screen media evaluation.